Sciatica is the term used to describe radiating leg complaints that result from degenerative disease of the lumbar spine, most commonly a herniated intervertebral disc. Patients can present with a variety of symptoms including pain, numbness, and weakness. The technical term for sciatica is Radiculopathy, and results from irritation of one or more spinal nerves. Radicular, or sciatic, pain can present as an aching, throbbing, or stabbing pain and is commonly located in the back or outside of the thigh and in the calf or shin region of the lower leg. The pattern of complaints depends on the specific spinal nerve involved since each nerve supplies specific areas of skin and muscles within the lower extremity. The lower spinal nerves are more often affected since the lower lumbar spine demonstrates degenerative changes with the greatest frequency. The pain is often activity related; any maneuver increasing the tension or pressure on the nerve, such as lifting a straightened leg or coughing, can produce a significant increase in pain. If more significant nerve irritation or damage occurs, pain may be replaced by numbness and isolated leg muscles may become weak. A “foot drop” is a common weakness pattern associated with sciatica and involves an inability to bend the ankle in an upwards direction. On rare occasions a herniated disc can produce severe compression on multiple nerves causing weakness of the lower extremities, groin numbness, and loss of bowel or bladder control. This condition, referred to as Cauda Equina Syndrome, is considered an emergent situation and requires immediate medical attention. However, cauda equina syndrome, as well as isolated weakness, is a rare manifestation of a herniated lumbar disc. 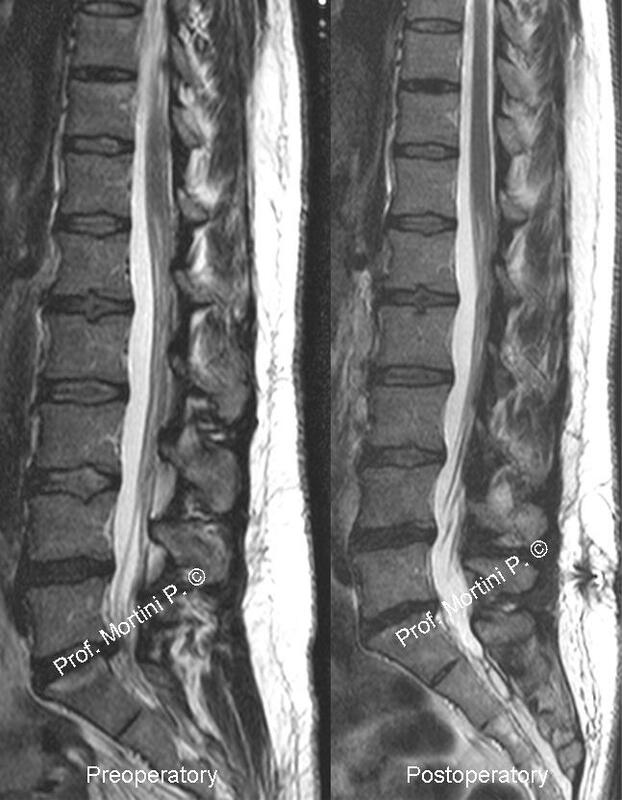 Extruded Disc – More severe extension of disc without connection to disc interior. Symptoms are more often associated with the Protruding and Extruded categories of disc disease. When sciatic pain does not respond to conservative measures or if a patient presents with a progressive neurologic deficit, involving either numbness or weakness, surgery is indicated. The goal of surgery is to decompress the nerve by removing the cause of compression. When due to a herniated disc the procedure is known as a Microdiscectomy (see microdisectomy). When due to lumbar stenosis the procedure most often performed is a Laminectomy (see laminectomy). Occasionally, a combination of the two is required.